Photographed on the Tuesday 30 August 2016. This Carder Bumblebee was photographed near ‘Freshfield Dune Heath’, a small Lancashire Wildlife Trust, nature reserve in Lancashire, but the single largest dune heath system in Lancashire. 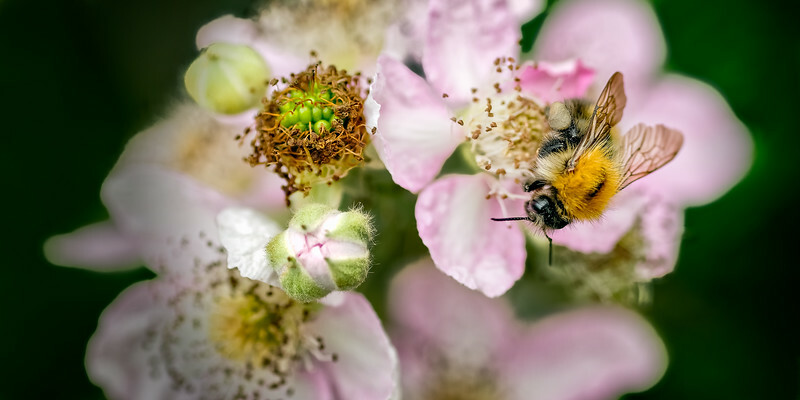 Here the bee is feeding on bramble (Rubus fruticosa). There are not many Dune Heaths systems left in the UK and they are fragile systems that need careful management. However, they can have a rich diversity of wildlife. All bees belong to the order Hymenoptera which also includes wasps’ ants and sawflies. There are about 1500.000 Hymenoptera described globally though the true figure may even exceed 1 million. Bees initially fall within the suborder Apocrita which contains many of the various wasp-waisted forms the other suborder being Symphyta sawflies and their relatives. The Apocrita is then subdivided into sections, the Parasitica & Aculeata. Bees belong to the Aculeata along with ants, hunting wasps and various other parasitic wasps not included in the Parasitica. The classification of the Aculeata is very complex due to the way these portion of the Hymenoptera have evolved i.e. essentially bees and ants are specialised wasps. Hence looking within the superfamily Apoidea, several bee families occur side by side with hunting wasp families. The Bumblebees belong to the Family Apidae, subfamily Apinae and Genus Bombus. The Apidae is a cosmopolitan family of over 6000 species. Like most bees bumblebees exhibit sexual dimorphism where the sexes look identifiably different.